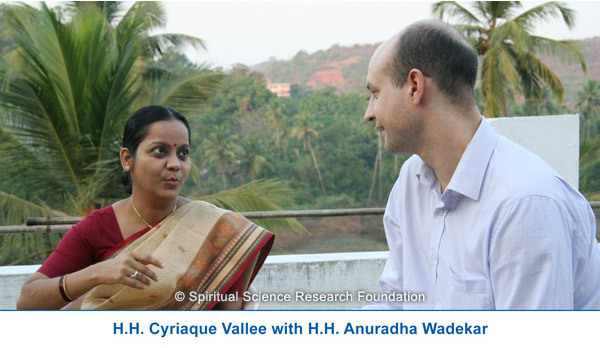 This article on the spiritual journey of His Holiness Cyriaque Vallee includes excerpts of his life which will inspire and motivate any seeker who is making efforts for God-realisation. Throughout his life, from childhood until now, the one thing that stayed dear to his heart and remained central to his life was the presence of God. With earnest desire and perseverance for spiritual practice, He was stoic in all of life’s situations. He continued his own spiritual practice till he met his Guru H.H. 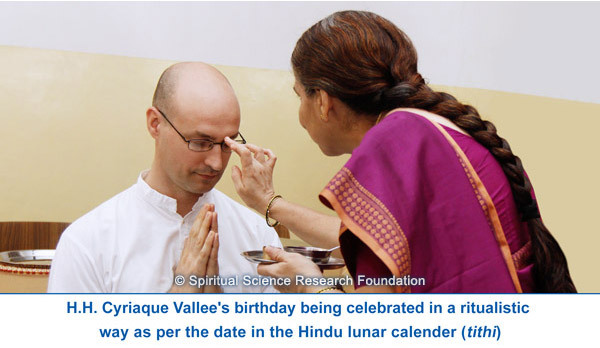 Dr. Athavale on 24 December 1999 after which his spiritual practice took a big leap. 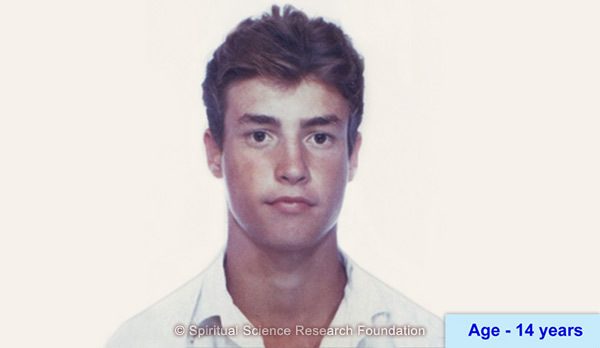 This article narrates incidents right from his childhood to later becoming a fashion model, then meeting Yoya his future wife, becoming a father (Anastasia is his 10 year old daughter), his beginning with spiritual practice, then going on to completely sacrificing his life for God’s mission and later attaining Sainthood. Another unique point about him is that He has come to Earth from a higher region of Heaven (Uccharswargalok). He was born at a spiritual level of 50%. His spiritual level dropped to 40% afterwards. (This is true for everyone who takes birth from higher positive subtle regions. It is because one has to undergo destiny. But later because of their spiritual practice from previous births, they are able to progress spiritually very fast and go ahead.) Hence, H.H. Cyriaque has many Divine qualities. By nature, he has a warm and loving personality which makes others feel close to him. 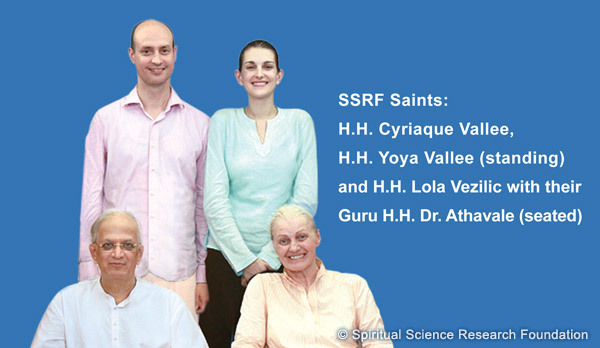 Over the years he has become a pillar of support to seekers around the world who are striving for spiritual growth. At the time of compiling this article (November 2014), H.H. Cyriaque’s spiritual level is 73%. As a child, H.H. Cyriaque would get glimpses and strong realisations about himself, the cause of which were beyond his understanding. However they played over and over in his mind and so he sought explanations for them. One such experience occurred at around the age of 7 when H.H. 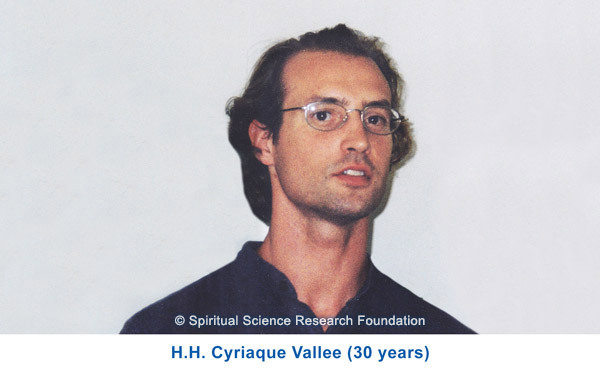 Cyriaque felt that this era was important from the viewpoint of spiritual practice and that it was very crucial that he should be born at this time for a higher purpose. When he was 10 to 12 years old, H.H. Cyriaque would often pray in the school chapel. On one occasion, he narrated, “I experienced immense calmness suddenly as though everything around me had lost significance. After that for many hours I was feeling very calm and I did not feel hungry or thirsty. I felt peaceful like never before. Now looking back I feel I had somewhere connected to God and experienced Bliss for the first time, without understanding the concept of Bliss. In his former years, H.H. 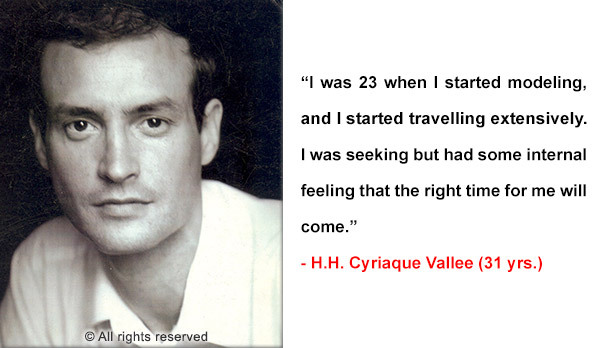 Cyriaque struggled with dyslexia, which affected his schooling to some extent. At the age of seven, he was interested in learning Judo. H.H. Cyriaque excelled in it and became a black belt at the age of 18. He also participated in various competitions and international tournaments. 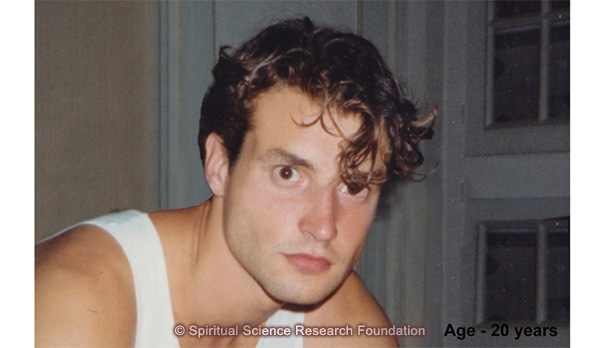 As he grew up, although he joined the modelling profession, his quest for Spirituality continued. These were his formative years and he pondered upon various aspects of life. He continued to juggle between a worldly and spiritual life. H.H. Cyriaque realised that he was attracted to both. He shared, “When I was around 20 years old, I believed that the majority of people we see are not how we humans are meant to be, and that we can grow spiritually. I saw that people were so enveloped in problems and pain. However, I felt that humans had the strength to end this state of despair and grow spiritually. I wanted to find a spiritual master. I was also attracted to Tibet and India and even contemplated becoming a Tibetan monk. “When I started modelling, I was 23 and I started travelling extensively. I was seeking but had some internal feeling that the right time was yet to come. I met different spiritual groups but would quickly realize that these were not the correct paths for me. Most of the time, the only topic that I would discuss with anyone was Spirituality. Otherwise I did not like to speak and would prefer to remain quiet. “Many times I would intuitively perceive what was going on in people’s minds, or what they were thinking or did in their day-to-day lives. I don’t know if it was my imagination, but many times I would actually feel different energies during interactions with different people. However I lacked complete understanding of the spiritual dimension and so I would often become confused with what I perceived. Quiet often these intuitive feelings would prove to be true. This relationship that Yoya and H.H. Cyriaque shared soon developed into a spiritual one. Yoya is hearing and speech impaired but when H.H. Cyriaque met her, he was not deterred by it. Most people will not choose a life partner with some disability. However, H.H. Cyriaque felt these outwardly limitations did not matter as he was able to perceive a very positive person in Yoya. When he met her, he told her that he remembered Beethoven who was one of the most famous and influential of all composers. Yet, Beethoven believed that he would have liked to be fully deaf so that he could compose better music. Music of the Soul could be created when one hears music from within. Thus, H.H. Cyriaque had a strong feeling that Yoya’s deafness was in fact her strength. It was due to her inability to hear that she was more connected to the Divine and so paradoxically, it was never a limitation. 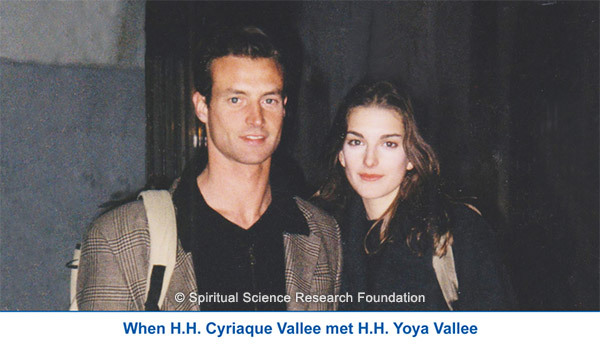 Meeting Yoya that day was an opportune moment that paved the way for his true spiritual journey. In February 1999 H.H. Cyriaque travelled to Milano, Italy. That is where Yoya and he came together for the second time. H.H. Cyriaque reminisces, “That morning, before meeting her, I had a unique experience. I was in the shower, I was happy and I was singing a song. However at one moment a voice came out of me and repeated ‘Ave Maria’ three times. I stood paralysed and had goose flesh. I got very confused as I felt it was not me who said that. “That afternoon, I met Yoya in her agency. Then in the evening I went with her and her mother, Dragana, to their home and we started to speak about Spirituality once again. 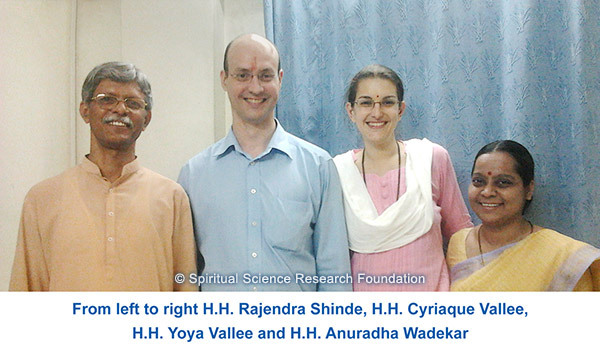 Dragana and Yoya had started spiritual practice by then, so they introduced me to chanting. I was surprised as I remembered the experience of having chanted Mother Mary’s name, in French, that very morning in the shower. I remember that Dragana was telling me some points about Spirituality. It felt as if those points were hitting me from inside and I cried from within. I was losing body awareness. “I started chanting immediately. I remember going on a trip for a few days, and my chanting was going on all the time. When I came back I invited Yoya and her mother to dinner at a restaurant. Dragana was sitting to my right and during the course of the evening, Dragana started getting restless as she could feel there was some unpleasant electrical current that was surrounding me. She tried to touch my right shoulder and was taken aback as she experienced an electric current that almost made her feel as if she had gotten burnt. She sensed that something strange was going on. Then she placed her hand above my forehead at a distance of about 10 cm. Later she told me that she did not have any idea why she placed her hand on my forehead. This was one of the most important spiritual experiences of H.H. 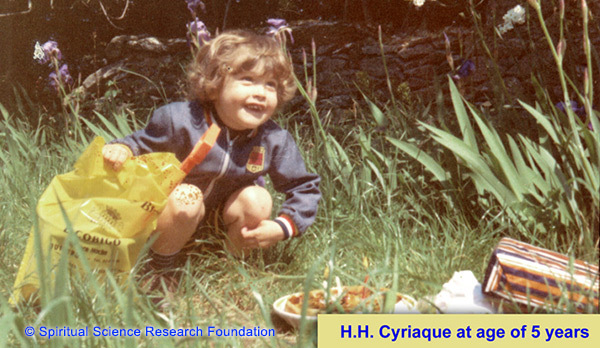 Cyriaque’s life — one that instilled faith in him and propelled him to enhance his spiritual practice further. Later, in 2001, as advised by H.H. Dr. Athavale, H.H. 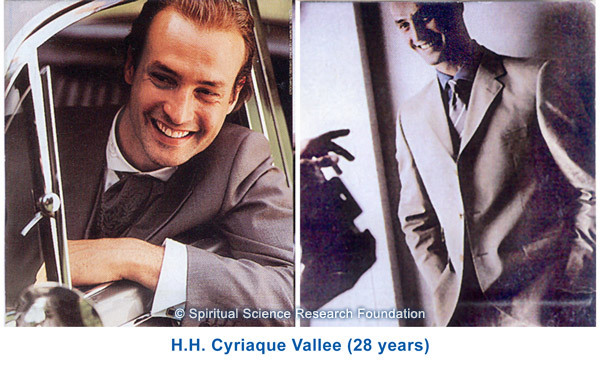 Cyriaque received further spiritual healing for the distress he was experiencing from H.H. Joshi Baba – a Saint from Mumbai, India. H.H. 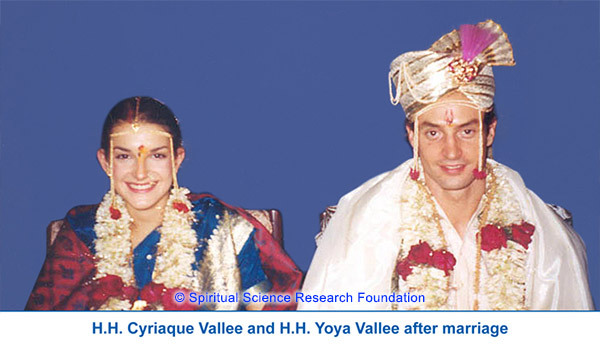 Cyriaque visited India for the first time in 1999. He vividly recalls those days. 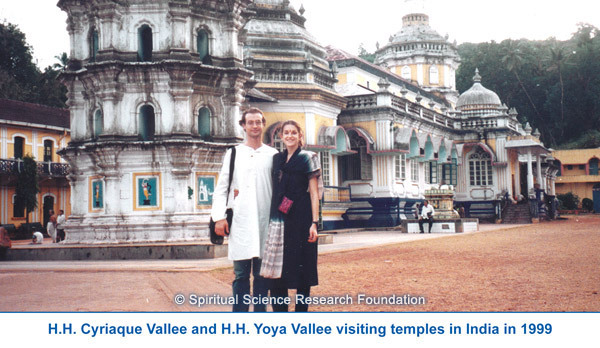 “In December 1999 I went to India for the first time, along with Yoya and her mother Dragana. We had previously asked about getting married there. “On 25 December 1999, I had to invite H.H. Dr. Athavale for our wedding. I went to His room and then I bowed at His Holy Feet. My whole body started shaking and when He placed His hand on my back, after a few seconds, everything became like a ball of light and I could not see anything for many minutes. H.H. Dr. Athavale said, ‘I give you new life!’ Then I started crying due to being immersed in spiritual emotion after the overwhelming experience of meeting H.H. Dr. Athavale for the first time. “We had several satsangs with H.H. Dr. Athavale, and I would never know how long they lasted and also sometimes I would also not understand what was being spoken. Sometimes, due to my distress from departed ancestors, I could not look at Him or His form would look blurry. In February 2001, H.H. Cyriaque and H.H. Yoya went back to India for six months. At the time since H.H. Cyriaque was facing ancestral distress he would suffer from severe stomach pain that would deplete all of his energy. So, H.H. Dr. Athavale sent H.H. Cyriaque to a Saint, H.H. Joshi Baba, who used to practice removal of spiritual distress. H.H. Joshi Baba did not speak English, but on one occasion when He was speaking to another person, H.H. 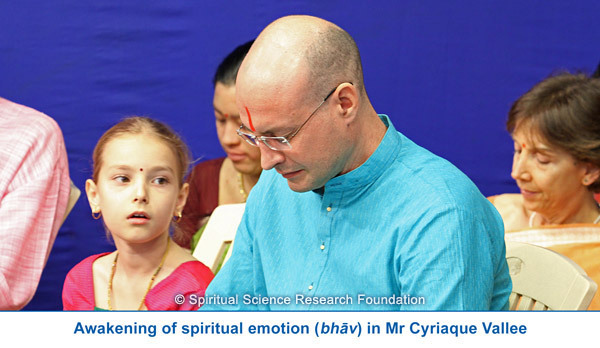 Cyriaque felt like He was speaking to Him and saying, ‘Whenever faced with any difficult situation or whatever happens in life do not fear, just keep on chanting, as chanting is most important and in the end only chanting will remain.’ These lines stayed with H.H. Cyriaque. He continued to wear the amulet given by H.H. Joshi Baba for almost 2 years. Then, one morning while taking a shower, H.H. Cyriaque saw that the amulet was gone and he could not find it anywhere. After this, his stomach problems stopped. Around this period of time, H.H. Joshi Baba renounced His body. This reinforced the feeling of gratitude in H.H. Cyriaque for all that H.H. Dr. Athavale and other Saints were doing for him. After returning to Europe, H.H. Cyriaque was trying to implement the different steps of spiritual practice. But the challenge was to shoulder the worldly responsibilities of a married man, combat spiritual distress and to simultaneously continue spiritual practice. In this phase, H.H. Cyriaque sacrificed his comfort and served humbly in the various ways mentioned below. This is what led to his spiritual progress. “After 2004, the negative energy troubling Yoya started to manifest almost daily. I sometimes had to hold her with all my strength to restrain the subtle-sorcerer (māntrik) from being violent. During these times, I would remain in one position for an hour or more, 2 to 3 times a day. Many times after the manifestation I would feel very tired and sometimes I would sustain some small injuries from the scuffles with the negative energy in Yoya during a violent manifestation. “Anastasia was small, maybe around 2 years old. 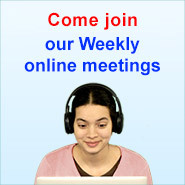 One evening at around 7 p.m. the negative energy troubling Yoya started manifesting and I had to hold her down. It was dinner time and Anastasia was crying as she was hungry. I could not leave my grip on Yoya to attend to Anastasia. I began praying to H.H. Dr. Athavale and God for help. Just at that moment Anastasia went and opened the fridge on her own. This was something that she had never done before as she was just too small. She started eating a sandwich that she found in the fridge. I felt gratitude from within. “After the manifestations were over, Yoya would be so drained that she would have to sleep or lie down. I would also feel tired after her manifestations but I had to forgo resting as I had to look after both Anastasia and Yoya. Many times I would feel that God was giving me the energy to withstand my daily routine, as basically I would wake up almost daily at around 5 to 6 a.m. to go to work and by the time I would get back home, the negative energy in Yoya would start manifesting. Sometimes, during the manifestation I would be able to remain stable and calm, and then I would not be so affected after the manifestation. At other times, I was unable to remain stable and at those times I would be affected afterwards. “A few times when the manifestation was very strong and the situations were difficult, I would pray with much more intensity and the manifestation would stop almost instantly. I realised that I needed to make efforts to increase prayer with more spiritual emotion and sincerity. “For a few years, from 2003 to 2007 I had a full time job and I was not doing much sēvā. I was mainly looking after Yoya. In 2007 H.H. 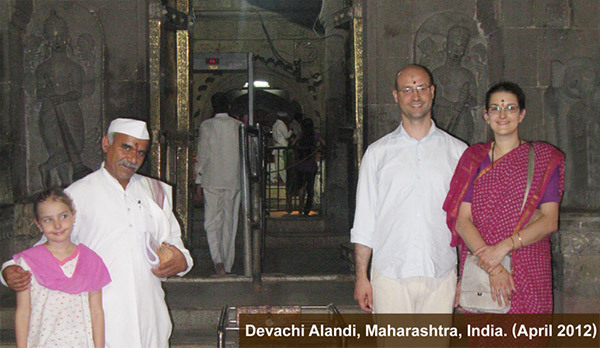 Dr. Athavale told me to look for a less time-consuming job, so that I could increase seva. “By the end of 2007 we moved to a new city called Chartres where I was to start a new job that would give me more free time. After 2 months I saw that this job was not going so well so I decided to quit. One evening I was speaking with a seeker from Serbia who casually asked me: ‘Why don’t you come to Serbia?’ When she said this I felt Divine consciousness and I was puzzled as to why I was feeling so. I introspected intellectually if it was possible to move there. After consulting with Dragana who was in Belgrade at the time, we sold most of our furniture and we packed everything into one car and drove across Europe to live in Belgrade. 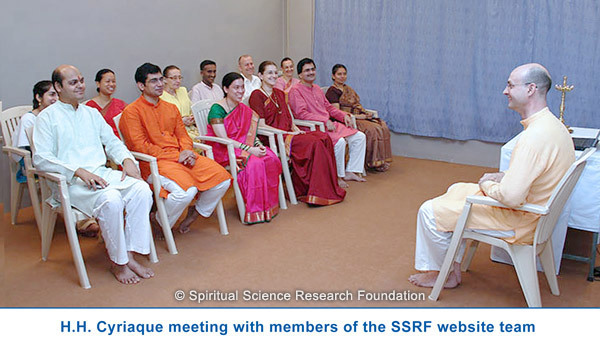 The main goal behind our move was to be among seekers and to increase spiritual practice. 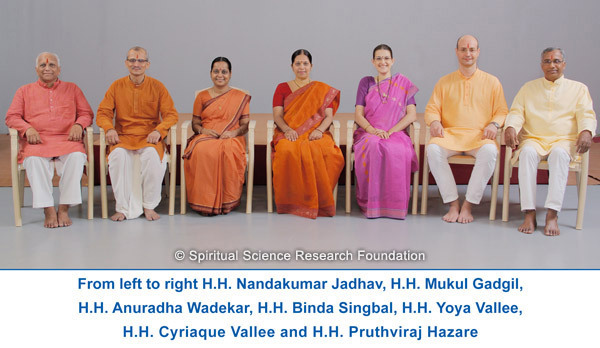 Editor’s note: There is a saying in Spirituality that real spiritual progress happens through sacrificing one’s mind, body, intellect, wealth and ultimately everything at the Guru’s Holy Feet. H.H. Cyriaque’s life is an example of sacrifice and obedience towards the Guru’s directives. Editor’s note: If the importance of the river Ganga can be understood by a foreigner, then why are Indians not preserving the spiritual purity of the river Ganga and making efforts to keep it clean and prevent its pollution? The pictures show the transformation that came about in H.H. Cyriaque, H.H. Yoya and Anastasia after staying in the ashram for 4 years. Shifting to India was in a way a paradigm shift for H.H. Cyriaque, H.H. Yoya and Anastasia. Adapting to a completely different culture, lifestyle, food, etc. was difficult. H.H. Cyriaque said, “When we came to India, it was the first time that we were staying in India for a longer period of time. Normally due to work-related schedules I used to come only for 2 weeks and had come for 1 month only once in January 2009. In the beginning I had difficulty sitting daily for many hours and doing seva in front of the computer and after 2 months my mind began feeling restless. “Moving to the ashram was a big step and it was not as easy as we thought because the culture is different. In the ashram there are around 300 seekers, there are various rules as well as limitations of language, and the food is also different. After the initial 6 months I felt my mind was resisting trying to adjust to the pace at which seva is done in the ashram. Seva in the ashram is done for many hours throughout the day, every day and there is no day when we can say something like ‘Today is Sunday, I will rest’. In our previous lifestyle, the mind was used to doing many other activities, so it wanted its free time or to remain in its comfort zone. Gradually, H.H. 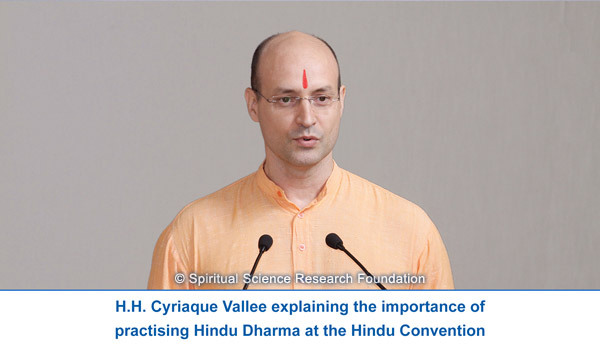 Cyriaque was able to adapt and put in sincere efforts to increase spiritual practice. All the seekers started feeling close to him and within a couple of years his spiritual level increased to 62%, and by 2012 it was 66%. His satseva responsibilities also increased. Below are some of the qualities noticed in him while he looked after the SSRF unit in the ashram and its activities worldwide. H.H. 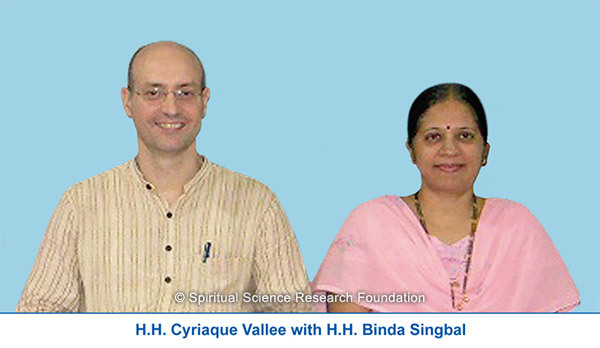 Cyriaque Vallee has been in the satsang of many Saints and has learnt invaluable knowledge from them. H.H. 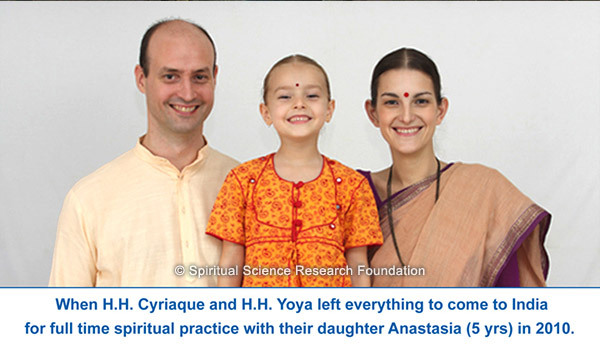 Cyriaque progressed spiritually through doing satseva. He elucidated the efforts he made to do continuous seva. 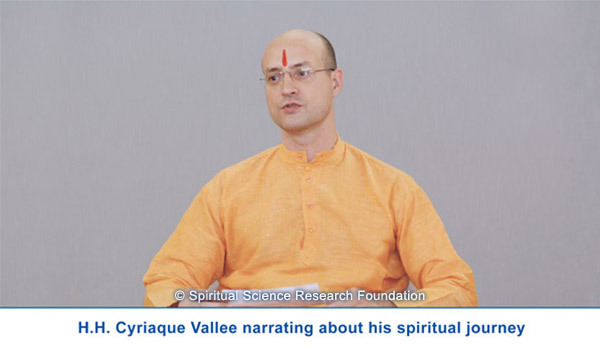 “When I started spiritual practice in 1999, I did very little seva for many years thereafter, due to my own distress and that of Yoya’s, and also due to work and the nature of my mind. At one point I realised that all these years I did not make efforts in this aspect of spiritual practice. I remembered that in spiritual practice we have to offer the body, mind, intellect and wealth. Offering the body and wealth was easy and I realized that the mind and intellect can be offered through seva. I started to make much more efforts in seva and I realised that through seva my spiritual progress could happen. I started to be dedicated to seva, as it was helping me to progress and develop Divine qualities and overcome my personality defects and ego. The more I was doing seva, the more I would start experiencing a different kind of state, that of spiritual emotion and Bliss. “I knew that insecurity was the biggest obstacle for my spiritual progress. It was in particular an obstacle when undertaking spiritual practice for the sake of society. I took every opportunity to work on it, by facing every situation or trying to see how I can overcome insecurity in that situation. I would try to introspect about the correct way to do things, how I should behave and act and what I should not do due to insecurity, so that my mind would be ready to face situations. I was praying sincerely to God and H.H. Dr. Athavale as I felt this was something I could not overcome. I also took a lot of autosuggestions. “I had a few spiritual experiences when I started to undertake spiritual practice for the sake of society (samashṭi sādhanā). When I was conducting one lecture in a workshop about the importance of samashti spiritual practice all of a sudden I experienced a lot of Bliss. The experience was so strong that it gave me the realization that only through samashti spiritual practice can we experience this kind of state. I started to make more efforts to develop qualities to be able to do and learn samashti spiritual practice. Progression from the 60% spiritual level to attaining Sainthood requires dedicated efforts. H.H. Cyriaque passed that hurdle also with yearning and spiritual emotion. He describes below what efforts he made. “In 2010 the spiritual level of one seeker I knew well was declared to be at the 60% spiritual level. When I saw that moment on video and saw how she experienced spiritual emotion, how she felt H.H. Dr. Athavale’s presence and gratitude, it struck me deeply. I realised that I was looking at the 60% spiritual level from a wrong viewpoint. I wanted to reach 60% out of the ego that I want to be at 60%, but the 60% spiritual level is not about the number. Instead it is about how much one feels H.H. 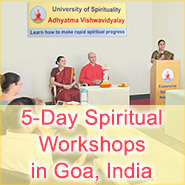 Dr. Athavale and God inside, and how much spiritual emotion and gratitude one experiences. I realised that I am lacking in all these points. That day I felt I had wasted many years and so I started focusing on the efforts I should be making. “I made efforts to increase seva, to increase prayers and I tried to do everything in a more perfect way. I felt that God was helping me, and that my sincerity was growing compared to before. I would try to be more serious about personality defect removal. I would not listen to the mind, and many times I would try to go against my mind. For example if I made some mistakes and the mind would give some justification, I was trying to stop it and to see the defects due to which the mistakes occurred. Another example is that when I had a few different sevas, including making some reports or tables, and the moment my mind told me ‘This table is difficult, I will do the other report first’, then I would do the opposite of what my mind was telling me to do. Once I was sitting in seva for 2 hours or more and I had the thought to take a break and have a snack but then another thought pushed me to sit back for seva. It felt like it was God’s hand keeping me seated and I continued with seva. For ego removal I would make efforts not to hide my reactions in front of seekers and tell them instead. I would make efforts not to protect my image in front of others. I would take atonements like wake up at 5:30 am early in the morning to do seva. I would be strict with myself and would feel remorse for small mistakes. I have defects of rushing and impatience and I write emails with spelling mistakes. I would take atonements even for those kinds of small mistakes. Many times I would wake up very early in the morning and would start seva and later would go to bed late around midnight. My mind would tell me ‘You must be tired as you woke up early and it is late now so you better go to bed’, and then the second thought would come and tell me to feel for myself how I was and not to listen to the mind. Often I would realize that I was not physically tired, so at those times I would stay up. H.H. 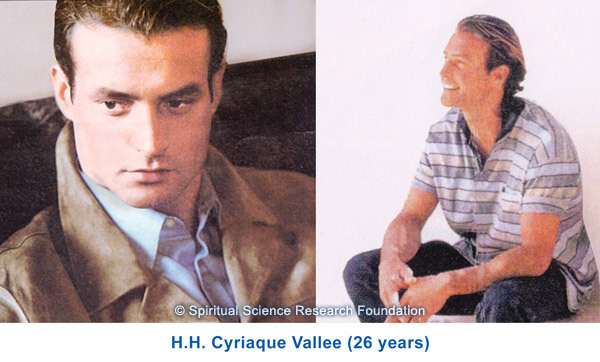 Cyriaque reflects that his innate love for God laid an important foundation for his personal development, and that spiritual practice helped him to improve it further. We pray at Guru’s Feet that we learn from this article and are able to increase our spiritual practice.